Successfully Added Bone Conduction Headset + Camera - Wireless Earphones, FHD Camera, Hands Free, Bluetooth 4.0 to your Shopping Cart. These bone conduction wireless earphones with built-in camera are an awesome way to capture full HD video, be it documenting your next adventure or taking the dog a walk. Sitting on your head the lightweight camera will record anything you look at in 1080P definition. At just a fraction of the weight of an action camera and with the added bonus of being a Bluetooth wireless headset it's the perfect way to capture the world around you with minimum fuss all while keeping your hands total free. This head mounted camera will help eliminate the shaky shots you get with handheld cameras. With Bluetooth support the bone conduction headset will let you answer calls hands-free and listen to music all while your recording. With bone conduction, the audio is transmitted to your cochlear through tiny vibrations at the top of your jaw, and unlike audio waves, these will not be affected by external noises, if you wear a pair of earplugs at the same time you would be totally unaware of any outside noises. However, the best advantage of bone conduction is that without anything stuck in your ears you can hear the rest of the world around you, be that cars honking their horns, people talking to you or birds tweeting. So you won't go deaf cranking up the volume and will be much more aware of what’s going on around you. Whether you are out on your bike, skating, running, or just strolling to work this is much safer and more rewarding way to enjoy music and take in the world around you. 16GB of storage is enough for hours of video recording and images can be snapped at an impressive 2592x1944 resolution. The 500mAh built-in battery will bring a few hours of usage when not recording and is fast to recharge via the USB port. This will also let you transfer pictures and video to a computer where you can edit and share them with friends and family. 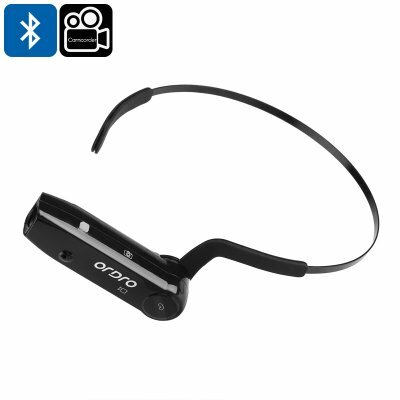 The ORDRO EP3 mini action camera with bone conduction earphones comes with 12 months warranty, brought to you by the leader in electronic devices as well as wholesale action cameras, wireless earphones and all manner of cool gadgets..